The shape of Wingspan inspired me to another variation. 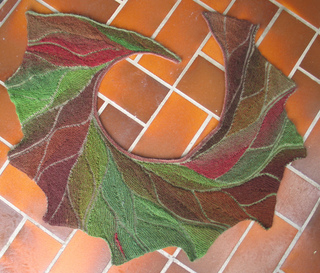 This time I tried out the technique to get leaf shapes as a result. I wanted to match the shape to the color of the yarn. 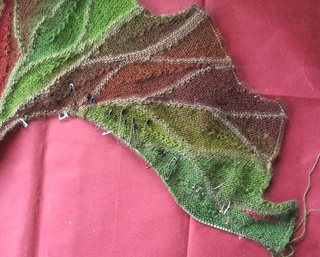 This was not quite easy and so I failed in some ways what doesn’t really destroy the impression of the whole scarf. 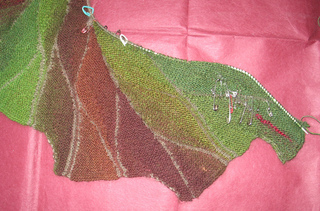 The yarn also was not convenient: the color flow stopped at a point and continued in another hue. 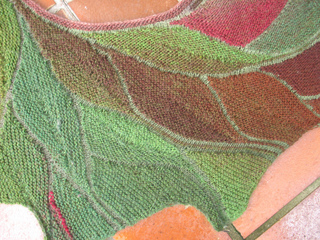 There were also missing some meters of the whole skein so I had to substitute with another colorway at the border. 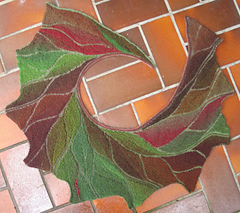 The “inbetweens” of the leaf shapes were made from a leftover of DROPS Delight as a result from casting on 106 stitches and working 10 triangels. 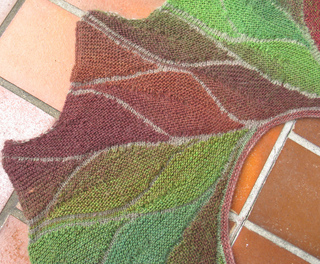 There is a distinction between free short-row-knitting and “guided” short-row-knitting. The tutorials will at first teach you to knit “guided” short rows which have calculated stanzas to avoid frustrating beginners. Free short-rowing as worked in Wingswing has its own rules. You don’t need a pattern because its on your own to create and calculate your project. You cannot know how your project will look in row 68 i.e., but there are rules to know what to do in the special situation. A pattern for free short-rowing is theoretically possible but practically would have 100 or more pages, because every single row doesn’t look like the one before and every segment is different from each other. You won’t pay for it, I bet! 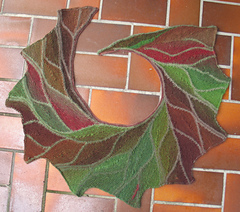 Advanced knitters of free swing-knitting techniques only need a few details to knit a similar project. The different color fields are knit in a special algorithm. That means: the short rows are shortened in various intervals. Those intervals are combined in a numerical order. This order is determined by yourself before starting to knit and will never change until you finish your project. This will result in harmonic forms. To change the order or the algorithm within the project is no swing-knitting but an own haphazard interpretation of short-row-knitting. 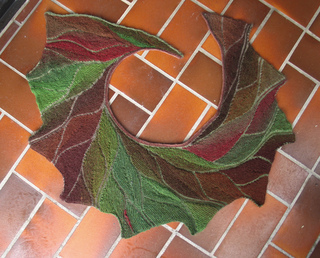 For knitting a project like this you should have advanced skills in shortrow-knitting as in free swing-knitting. It’s definitely not a beginner’s project. Many thanks to the designer for this scarf, I hope for it to be chartbreaking!